Complete RevitaLens multipurpose solution is suitable for all types of soft contact lenses and is designed to disinfect and moisturise lenses. For effective cleaning, it is recommended to rub each side of contact lenses before use. 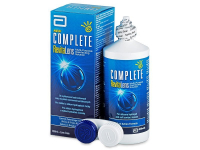 Exclusive Complete RevitaLens multi-purpose disinfecting solution is a new-and-improved version of the old Complete Solution. Complete RevitaLens Solution disinfects and moisturises contact lenses and is suitable for all types of soft contact lenses users, including those with sensitive eyes. Complete RevitaLens cares for your lenses and eyes by helping maintain a stable tear film, which, along with sufficient moisture, is an important factor for comfortable, long-term contact lens wear. This package also contains a contact lens case. Read more about Complete RevitaLens solution. Great solution for monthly contacts. They feel cleaner and clearer, even at the end of the month.